PicBackMan is a powerful duplicate photo cleaner app to dedupe your photos in minutes. It uses advanced technology to identify duplicate photos & sorts them into a separate folder on Mac and WIndows. It’s free too. 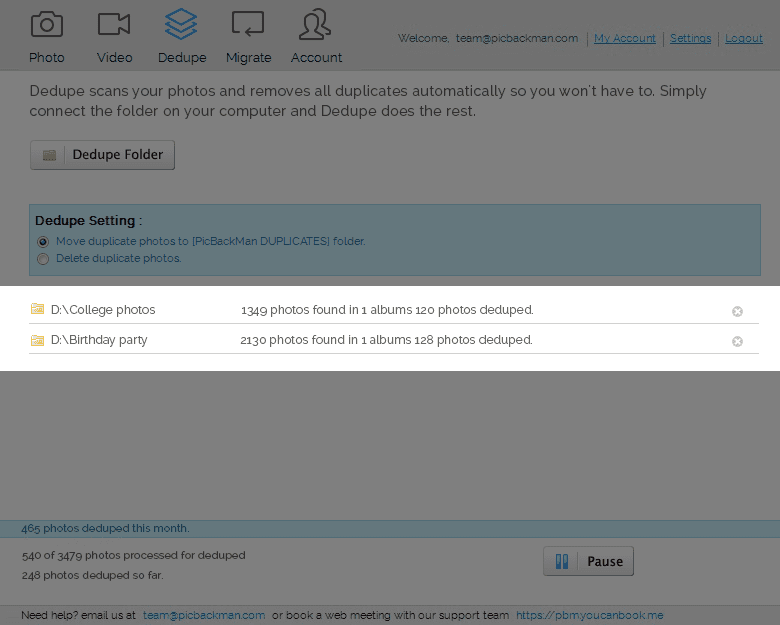 Get rid of duplicate photos, effortlessly. Don’t spend hours combing through folders to find duplicate photos. Simply point PicBackMan to your photos folder on your Mac or Windows 10 / Windows 7 and watch it do it’s magic. Dedupe folders Dedupe folders with PicBackMan effortlessly. ​Comprehensive dedupe Process dedupe on all photos of folder. Live reporting Experience actual dedupe count of files. Automatic error handling Experience actual migration count of files. Checksum based Ensures correct de-dupe even if photo file names are same. Put an end to hours of cumbersome effort to find and remove duplicate photos from your precious collection. PicBackMan does it in a jiffy. 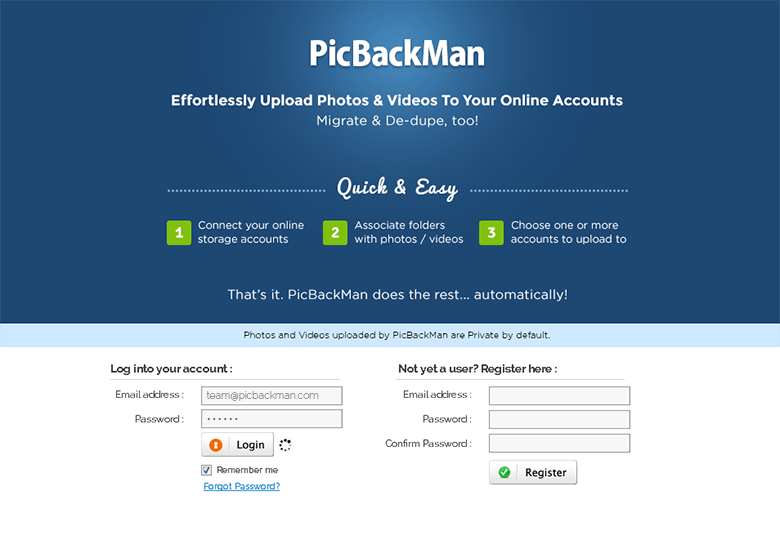 Download PicBackMan for your Mac or Windows 10 / Windows 7 and set it up - takes just 60 seconds. Create your account and you are ready to start Dedupe your photos. PicBackMan is free to start and you can upgrade to paid versions if and when required. Login to PicBackMan and hit the Dedupe icon at the top to open the dedupe screen. Then click the “Dedupe Folder” and select the folders you want to dedupe. 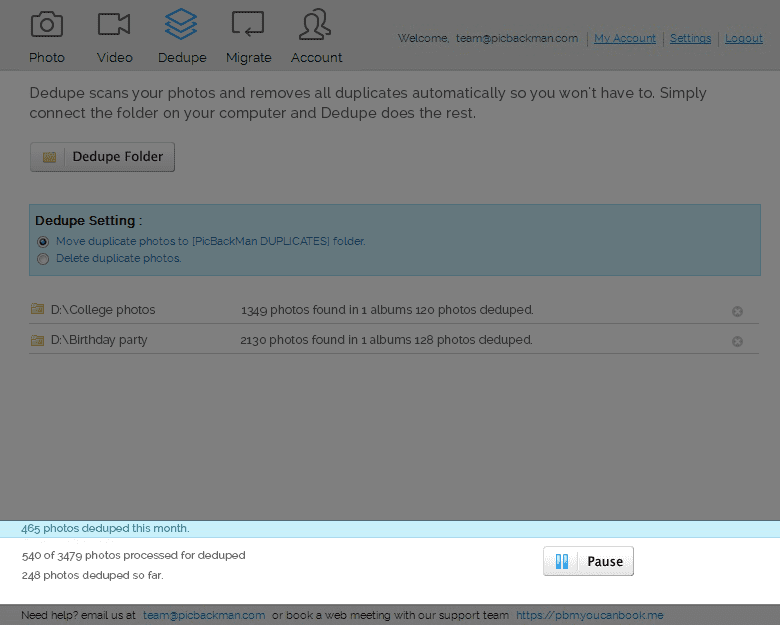 You can define settings for dedupe process and choose either to move duplicate photos to seperate folder or delete them permanently from your computer. Then sit back and see the dedupe of your photos happening right in front of you - the status bar shows you the activity and counts. For large dedupe it does take time so you can let it happen and go about your other tasks. PicBackMan doesn’t need monitoring at all.